Our divers continued their fantasy running by sweeping almost of all the gold medals contended...Well Done divers! In the coming few days, I'll only be updating on Sea Games...I hope I got the time to do so...Been very busy with new job...Tata! Just a comment for Skewers...They should have separate smoking and non-smoking area...Smelly! I wonder if it smells like a gold? Jewellery? Diamond? 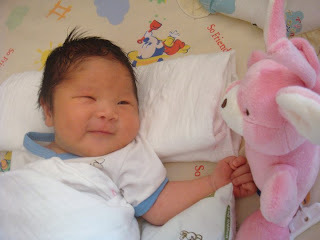 Beloved cousin Baby Justyn Lau was born on 30th June 2011! Such an adorable kid and I must say that he has been super obedient...He hardly cries...He will act crying with his facial expression instead...Haha...Cute boy! Me first time holding a baby! Life cant get any worse - My head is about to explode!!!!! FREE TVB SERIES DOWNLOAD - HK DRAMA! - Welcome to Dinoki TVB - Visit us at tvbdinoki.blogspot.com Remember to visit tvbdinoki daily for the latest updates on FREE tvb drama downloads! Closed .. - for now this blog is closed .. coz i lazy to blog edy .. sorry sorry..